← £837m wasted on Universal Credit IT? 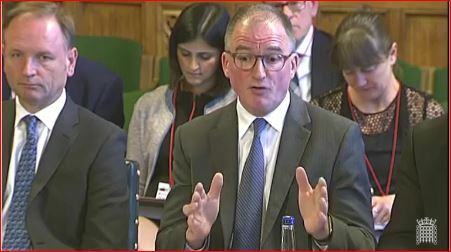 Johnathan Lewis, CEO Capita (right) and Simon Stevens, Chief Executive, NHS England (left) at Monday’s Public Accounts Committee. Capita’s CEO Johnathan Lewis was contrite and authoritative when he appeared before public accounts MPs in the House of Commons on Monday. He apologised unreservedly for what the committee chairwoman Meg Hillier called “a shambles”, which was Capita’s £330 seven to ten-year contract to run a range of services for GPs, dentists and ophthalmologists, as well as handle invitations and test results for cervical screening. Capita’s Primary Care Support Services contract began in 2015 and complaints about the service from medical practitioners began to flow months later. Capita made mistakes, said Lewis who was supported by his colleague Stephen Sharp, who reports directly to Lewis on public sector contracts. One mistake was that Capita tried to save money too soon by folding the work of 47 local NHS offices with 1650 staff into three offices without fully understanding that each office had a different way of working and a different way of delivering NHS services. With hindsight he said he would not have closed offices “until we had got the procedures operating on a national basis”. He conceded that if NHS England and Capita had deferred closing offices, the first two years of savings of about £60m would not have been achieved. Lewis said that Capita had invested £125m in the contract but, given the loss of profit margin, the losses would be closer to £140m. “We will not make money over the life of this contract,” said Lewis. An MP asked: why not walk away? Capita is now meeting 41 of the 45 KPIs and, though the company is making good progress against the remaining four KPIs, it doesn’t change the fact that “our initial execution on this contract was not good and for that we apologise unreservedly,” said Lewis. There were failings on the part of NHS England too. Health officials were so anxious to achieve the savings from closing offices and replacing old IT that couldn’t be relied on that they failed to test new national, standardised working practices and services before they asked a supplier to implement this strategy. The result was that officials at NHS England had no clear idea of how much work they were outsourcing. They left due diligence to Capita; and Capita admitted at the hearing it did not do enough due diligence at the bid stage. If it had understood how much work was involved it would have bid a higher price or not bid at all. NHS England also failed to involve most of the potential end-users – GPs, dentists and ophthalmologists in the design and planning of new services that would directly affect them such as pensions and payments. “There are other stakeholders that have historically not been brought into this process to the extent that they should have been, such as the BMA [British Medical Association] in how we might implement the digitisation of pension payments and the management of its pensions, or the Confederation of Dental Employers with regard to ophthalmic payments. When MPs questioned the top official at NHS England, Simon Stevens, there was little sign of humility, contrition or regret. He left an impression that the same problems could end up being repeated by a different supplier under a different contract. One Conservative MP Bim Afolami found himself “sticking up for Capita”. Stevens emphasised the £60m savings but made no mention any of the contract’s specific problems such as the thousands of patient records that went missing, dozens of women left off cancer-screening lists, the qualified GPs who were unable to work for months while the system delayed verifying their entitlement to go onto a “National Performers List”, the GPs who ran short of basic supplies or the GPs and ophthalmologists who suffered financial detriment because of delayed payments. Campaign4Change has repeatedly criticised Capita’s performance on Barnet’s outsourcing contract, in part because Capita and the council have been markedly defensive – thin-skinned. It was refreshing, therefore, to hear Capita’s newish CEO Jonathan Lewis being openly contrite over highly-visible failings in the NHS contract. He gave the impression to public accounts MPs of being a CEO who is determined to put right the failings for the sake of Capita’s reputation. The cost of correcting the problems seemed a secondary consideration. With Lewis at the helm, Capita’s share price has continued to rise in recent weeks. Less impressive at Monday’s hearing was Simon Stevens, NHS England’s chief executive, who seemed to imply that NHS England had done nothing wrong. It was a reaction we’ve come to expect from top civil servants after an IT-related programme disaster. It’s never the fault of officialdom. The reality is that NHS England was almost as culpable as Capita. NHS England rushed the whole outsourcing exercise – which doomed it from the start. It didn’t listen to critics who warned that primary care support services were too locally diverse and inherently problematic to standardise as part of a national outsourcing deal. Instead of first piloting and agreeing with GPs, dentists and ophthalmologists fundamental changes in working practices that would be needed across the country, NHS England went ahead with signing a co-called transformation deal with Capita. NHS England paid only lip service to engagement with the new system’s end-users in the medical professions. By its own admission Capita, because of its own internal shortcomings, went into the contract blind. What’s worrying is the way civil servants blithely repeat mistakes of the past and later say they did everything right. The National Programme for IT in the NHS – NPfIT – failed in part because it was rushed, the implications of “ruthless standardisation” were not fully understood at the outset and there was a lack of proper engagement with potential end-users in hospitals and GP practices. All these same mistakes were made by Capita and NHS England on the Primary Care Support Services contract. When ordinary human beings become senior civil servants there seems to be a requirement that they lose at a cellular level the facility to express humility and contrition. That loss is replaced by an overly prominent complacency. Whatever goes wrong is not their fault. Stevens said in essence that NHS England did everything right. Through its unpublished project reviews, the Major Projects Authority – now the Infrastructure and Projects Authority – endorsed NHS England’ s plans. All the so-called experts gave the outsourcing deal what Stevens called a “thumbs-up”. It would have been surprising if Stevens had said the public sector was in any way to blame. At least Capita has learned the lessons. It has a financial interest in doing so. This entry was posted in Campaign4Change, Capita, Department of Health, e-health, Government IT, IT projects, IT-related failures, Legacy ICT, Major Projects Authority, managing change, managing outsourced services, National Audit Office, NHS, NHS England, npfit, private sector lessons for the public sector, procurement, project management, public-private partnerships and tagged Cabinet Office. Bookmark the permalink. I note the same ‘mistakes’ or perhaps, tactics, being repeated. Those on the front-line/receiving end of projects are routinely ignored – both as potential victims and also as those who are sources of valuable information. As far as NHS England is concerned, today we have the report into the horrendous Gosport Hospital scandal. Apart from the hundreds of premature deaths of vulnerable patients, it is the systematic, almost practised, failures of the police and all branches of the medical profession that is being repeated. As is usual, those who did know what they were talking about were ignored, or vilified and dismissed. We value the sanctity of the hierarchy more than the lives of the defenceless. Following on from this, I have no doubt that if there is £20 billion on offer, despite what Mrs. May and her P.R. team say, the bulk will not go to front line staff or towards patient care. Even if the bureaucrats and their partners in the private sector have to change their names, don medical uniforms, acquire medical sounding qualifications, they will claim the bulk – they are motivated by money whereas those doing the genuine caring are too burdened to do the required wrangling. Undoubtedly, Capita has a valuable function in being paid to deflect attention and accountability away from, in this case, NHS England. As I understand it, that’s how the majority of Management Consultants earn their fees. Talking of which, I believe Capita has been awarded a £500 million MoD contract despite having the ‘highest risk rating.’ But, I imagine, as long as they don’t mind taking the blame when things go wrong, they will have earned their money. Thank for this article, Tony. I must away now and try to think of some ruse in order to get my cut of the £20 billion. “We value the sanctity of the hierarchy more than the lives of the defenceless.” Beautifully put. Thank you Zara.